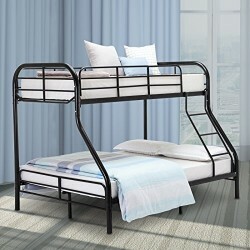 【Sturdy Design 】This twin over full bunk bed is made of power coated metal steel construction.And add 6 extra metal legs under the bed to make the bed more solid. 【Unique Inclined Ladder】 The inclined ladder attaches to the bed is more easy to up and down for your children and added safety simultaneously. 【Dimension & Service–Bunk Bed】79.92″Lx42″-57″Wx60.24″H,Weight Capacity:330 lbs (upper)/440 lbs (lower),If there is any part missing or damaged during shipping, please contact us first, we will solve the problem as the way you want.